Our hydraulic single drum vibratory roller is able to compact gravel, crushed stone, sand-macadam mixture, sandy soil and rock filling, and other non-cohesive materials on base course, sub base and embankment, etc. They are applicable to the construction of high-class highways, railways, airports, harbors, dams and large-scale industrial ground. 1.1 These hydraulic heavy duty vibratory rollers are fitted with Cummins turbocharged diesel engine. The coefficient of power reserve is large. So the paving equipment can offer good compacting performance even in an elevation of above 4000 meters. 1.2 Hydrostatic wheel and drum travel drive are operated by a single lever. There are four-range infinitely variable speeds available. 1.3 The hydraulic pump and motors are purchased from internationally well-known companies. 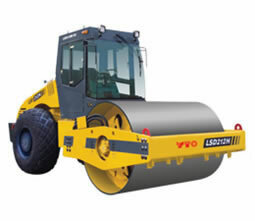 1.4 The road rollers are provided with adjustable frequency and amplitude vibration device. 1.5 These hydraulic heavy duty vibratory rollers are equipped with high quality planet gear reducer with built-in wet multi-disc brake. Fuel cut-off braking method is adopted to ensure the high reliability and safety. 1.6 The large circular arc windscreen and curve engine hood will create a unique streamlined machine appearance. 2.1 These hydraulic single drum vibratory rollers are designed with powerful Cummins diesel engine. The diesel engine with electronic control is available for you to choose from. 2.2 Hydrostatic wheel and drum travel drive are operated by a single lever. There are two infinitely variable speeds available. 2.3 The parking brake is mounted in the central input of driving axle. The oil cut-off braking method is adopted to ensure the high reliability and safety. 2.4 With circular arc glass driving cab and curve engine hood, the compactor is in streamline shape. An air conditioner can be installed in the driving cab, if required. 2.5 The engine hood can be turned over, which makes it easy to maintain the main hydraulic components. 2.6 These hydraulic single drum vibratory rollers are equipped with adjustable frequency and amplitude vibration device, and imported vibrating pump and motor. As a professional hydraulic single drum vibratory roller manufacturer in China, we can produce not only road roller, but also wheeled tractor, pickup truck, and so on. Our products have obtained E-mark and CE certificates. They are quite popular with our customers in Europe, America, Australia, and Asia, and more. If you are in need of road construction machinery or agricultural machinery, please contact us directly.